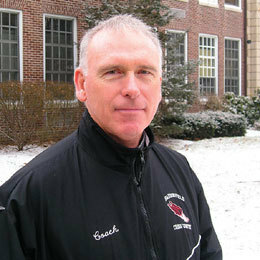 Under the direction of Haddonfield Memorial High School boys’ track coach Nick Baker (pictured), who has been coaching winter track since 1979, the team of Matt Nussbaum, Eric Lacy, Ben Potts and Tim Malloy competed at the New Balance Indoor Nationals in the mile relay, earning fourth place and All-American status. Bill Mullen, head coach of the fifth-grade Mount Laurel Red Bulls basketball team, won the Mount Laurel fifth-grade championship, beating The Heat, coached by Janice Milley, 33-31. The team finished their regular season with a 7-4 record. Led by coach David Gordon, the Mount Laurel 11th- and 12th-grade rec basketball team won the championship against Mount Laurel’s Team Lauria, ending their season with a 17-0 record. Honored as a “living legend” for her dedication to her team, former Shawnee High School girls’ basketball coach Gina Santone was recognized at the South Jersey Invitational Tournament, sponsored by the Al Carino Girls’ Basketball Club of New Jersey. Under the direction of Santone, the team has won four division crowns, two county championships and two South Jersey Group 4 titles. Led by Coach Mark Edwards, the sixth-grade Voorhees boys’ travel basketball team beat Seneca 39-33 in the South Jersey Basketball League Championship. The team ended their season with a 15-4 record. Mike Connelly’s Moorestown Youth Street Hockey Association Cadet Red Wings team competed against team Cool Runnings in the championship, winning the game in overtime. They ended their season with 12 wins, two losses and one tie. Wrestling coach Bruce Krohn organized Cherry Hill’s middle school wrestling tri-meet this year, bringing together teams from Rosa, Beck and Carusi for a district-wide competition that benefited the Cherry Hill Food and Outreach Council, which runs a food pantry in town. The Orange Crush, coached by Dave Golden and Sean Olin, finished their season undefeated in the sixth- to eighth-grade division of the Cherry Hill Recreation Basketball League. Six members of the Kennedy’s Moorestown girls’ swim team qualified for the New Jersey state meet. Senior Meghan Miceli beat her personal best time in the 100-yard breaststroke by three seconds, swimming it in 1:05.52 and breaking a school record. The Kansas Jayhawks fourth- and fifth-grade basketball team, led by Ted Flocco, beat the Texas Tech Red Raiders in the league championship. The team went 11-1 this season in the Marlton Recreation Council league. Coach Greg Ogden led his fourth-grade Cinnaminson team, the Vikings, to win the Northeast (Philadelphia) Girls’ Inter-County Basketball Championship against Bustleton by 10 points. The team ended their season with a 12-0 record.